According to what appears to be a Staples employee training document that has recently surfaced on Reddit, the upcoming HP Omen Obelisk 875-0xxx series desktop will feature the yet-to-be-announced NVIDIA GeForce GTX 1180 as its top video card option. While this could be a typo, it could also be the name of a non-RTX flagship product. 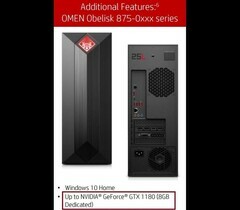 If the specs sheet for the HP Omen Obelisk 875-0xxx lineup of desktop computers that has just surfaced on Reddit is entirely correct, then NVIDIA will soon introduce a new non-RTX video card, namely the GeForce GTX 1180. According to the aforementioned document, this new card features 8 GB of dedicated memory, but there is no other detail to talk about here. However, this might not be a typo, since the GeForce GTX 1180 has also been spotted in a benchmark some time ago. When placing the benchmark results of the GTX 1180 next to the RTX 2080, it becomes obvious that this card is quite fast - very close and sometimes even faster than the RTX 2080. Since the GTX 1160 uses the same board as the RTX 2060, it would not be surprising to see the GTX 1180 releasing in the coming weeks as a non-RTX, non-Tensor sibling of the RTX 2080. What do you think about the GTX 1180? Is this only a typo or a new NVIDIA video card that we will get to see in action very soon?